Jurors in the trial of Boston Marathon bomber Dzhokhar Tsarnaev on Tuesday saw photographs of a blood-stained note speckled with bullet holes inside the boat he was captured in days after the deadly 2013 attack. Prosecutors consider the handwritten note a confession and say it refers to the motive for the attack carried out by Tsarnaev and his late brother, Tamerlan. In the note, written in pencil on the inside walls of the boat, Tsarnaev appears to decry U.S. actions in Muslim countries and says he is jealous of his brother because he is dead and now in paradise. 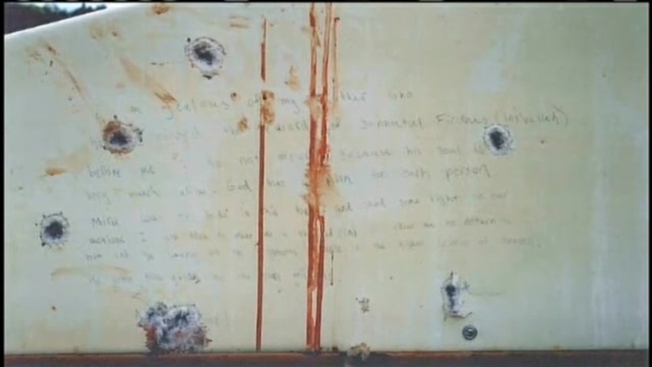 A photo released by the U.S. government of the bullet-ridded, blood-stained writings by Dzhokhar Tsarnaev in a Watertown, Massachusetts, boat. Another photo released by the U.S. government of Tsarnaev's writings in the Watertown boat he hid in during the manhunt. Tamerlan Tsarnaev, 26, died following a violent confrontation with police during a getaway attempt four days after the bombings. Dzhokzar, then 19, was found hiding in a boat parked in a yard in Watertown. "I do not mourn because his soul is very much alive. God has a plan for each person. Mine was to hide in this boat and shed some light on our actions," he wrote, according to the photos shown to the jury by prosecutors. The note also said: "The U.S. Government is killing our innocent civilians but most of you already know that. As a M (bullet hole) I can't stand to see such evil go unpunished, we Muslims are one body, you hurt one you hurt us all. ..."
"Now I don't like killing innocent people it is forbidden in Islam but due to said (bullet hole) it is allowed." Judge George O'Toole Jr. is still trying to decide whether to allow prosecutors to cut out and bring to court the panels of the boat to show jurors or whether to bring the intact boat to the courthouse to be viewed outside by the jury, as requested by lawyers for Tsarnaev, who is now 21. The judge ended court early Tuesday so he could go see the boat, accompanied by representatives of the prosecution and defense teams. The judge rejected a request from the media to allow a pool reporter and photographer to also see the boat. Three people were killed and more than 260 were injured April 15, 2013, when two bombs exploded near the marathon finish line. During opening statements at his trial, Tsarnaev's lawyer admitted he participated in the bombings but said Tamerlan Tsarnaev was the mastermind and recruited his younger brother to help him. Todd Brown, a Boston police bomb technician, testified that he saw the writing inside the boat when he was sent to check it to make sure there were no explosives or booby traps on board. During cross-examination of Brown, Tsarnaev's lawyers established that all the bullet holes were from shots coming into the boat when police fired. The officer said no bombs, guns or weapons of any kind were found inside the boat. FBI agent Steven Kimball, who testified Monday for the defense, also took the stand Tuesday, with defense attorney Miriam Conrad conducting the cross examination. Conrad pointed out that several of Tsarnaev's tweets mentioned in court Monday were actually quotes from American and Russian rap songs and from a Comedy Central show. She said the tweets shown to jurors Monday were taken out of context, pointing out that Tsarnaev also tweeted about "girls, cars, food, sleep, homework." Tsarnaev wore a black suit and light blue button down collared shirt. He avoided eye contact with everyone but his attorneys. Boxes and boxes of evidence were wheeled into the courtroom on two carts before proceedings began. Also testifying Tuesday were FBI agents involved in the collection, processing and analysis of evidence from the scene of the marathon bombing. One agent said shrapnel from the two pressure-cooker bombs was found on the ground, inside buildings and the rooftops of buildings, including a four-story hotel. 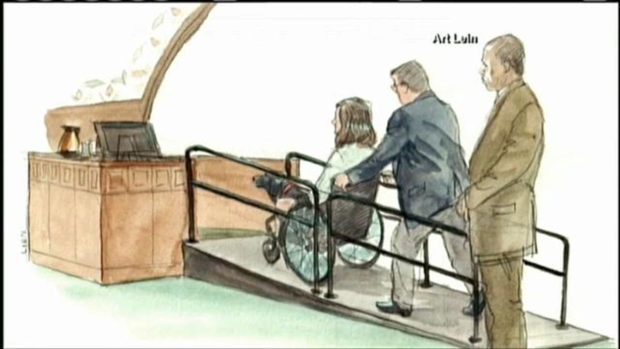 In court Monday, jurors heard descriptions of horrendous injuries from survivors, then saw a video of Tsarnaev minutes after the explosions walking calmly into a Whole Foods store to buy a half-gallon of milk. The juxtaposition by prosecutors apparently was aimed at supporting their contention that, after planting and detonating two bombs with his brother, Tsarnaev went about his life as if nothing had happened. The blasts on April 15, 2013, killed three people and injured more than 260. Jurors heard Monday from Jessica Kensky, a newlywed who described trying to shield her husband from seeing his mangled leg and being pushed to the ground by a bystander frantically trying to extinguish flames on her body.